Today, cyberattacks can place entire organizations at risk. Cybersecurity can no longer be delegated to specialists: success requires everyone to work together, from leaders on down. 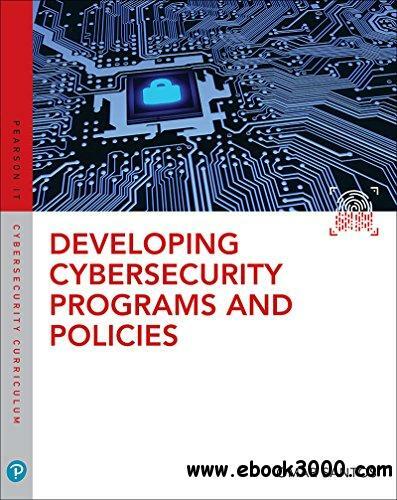 Developing Cybersecurity Programs and Policies offers start-to-finish guidance for establishing effective cybersecurity in any organization. Drawing on more than 20 years of real-world experience, Omar Santos presents realistic best practices for defining policy and governance, ensuring compliance, and collaborating to harden the entire organization. First, Santos shows how to develop workable cybersecurity policies and an effective framework for governing them. Next, he addresses risk management, asset management, and data loss prevention, showing how to align functions from HR to physical security. You'll discover best practices for securing communications, operations, and access; acquiring, developing, and maintaining technology; and responding to incidents. Santos concludes with detailed coverage of compliance in finance and healthcare, the crucial Payment Card Industry Data Security Standard (PCI DSS) standard, and the NIST Cybersecurity Framework. Whatever your current responsibilities, this guide will help you plan, manage, and lead cybersecurity-and safeguard all the assets that matter.